Queen’s graduates Peter Gallagher, Professor in Astrophysics/Associate Dean of Research at Trinity College Dublin (TCD) and his wife Emma Teeling, Professor in Zoology at University College Dublin (UCD), have been honoured by the French Government at a special ceremony held in Dublin (16 May). 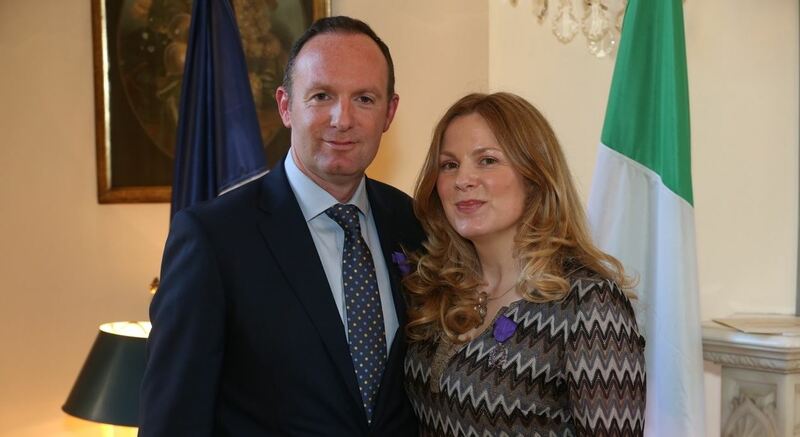 At the presentation at the French Ambassador’s Residence in Dublin, the husband and wife scientists were installed as Chevaliers des Palmes Académiques or Knights of the Order of Academic Palms, one of the highest accolades France bestows on academics and researchers. A Fellow of the Royal Astronomical Society (FRAS) and a Member of the Institute of Physics (MInstP), Professor Gallagher has an MSc in Opto-electronics and Optical Information Processing (1996) and a PhD in Astrophysics (2000) from Queen’s University. Professor Teeling, who is Associate Professor in Evolution and Genetics and Director of the Centre for Irish Bat Research at UCD, has a PhD in Molecular Phylogenetics from Queen’s (2001). Originally a decoration founded by Emperor Napoléon in 1808 to honour eminent academic staff of the University of Paris, since 1955 the Chevalier des Palmes Académiques is a national order of merit of France awarded to the most impressive and distinguished academics figures in the world of culture and education. The Chevalier award recognises Professor Gallagher and Professor Teeling’s contributions to scientific research in Ireland and around the world. Professor Gallagher is Professor in Physics and Associate Dean of Research at TCD, where he runs a large research group focused on understanding solar activity and its effects on Earth. In March he was appointed as an advisor to the Director of Science at the European Space Agency’s (ESA) headquarters in Paris, joining a group of just 12 scientists from universities across Europe. Professor Gallagher will be responsible for implementing a number of space missions under ESA’s Cosmic Vision 2015-2025, one of the biggest projects the agency has ever undertaken. As Head of the Irish LOFAR (low frequency array) Radio Telescope Project he is also building Ireland’s first research-grade radio telescope at Birr Castle in Co. Offaly, supported by Science Foundation Ireland. Speaking to TCD, Professor Gallagher said: “I have been working with scientists at Observatoire de Paris and the European Space Agency in Paris for many years, and two of my Trinity PhD graduates have gone on to become research fellows at Observatoire. Professor Teeling is Professor in Zoology and a member of the Governing Authority at University College Dublin. She is also a member of the Royal Irish Academy and on the board of the Irish Research Council. She holds a prestigious European Research Council grant for her research using bats as a model to uncover the biological basis of healthy ageing. Much of her team’s field-work is based in Brittany, France, in collaboration with the conservation organisation Bretagne Vivante. Story first published on TCD website; for further details please contact Thomas Deane, Press Officer for the Faculty of Engineering, Mathematics and Science at TCD, telephone 00 353 (1) 896 4685.